Unitised structural glazing creates gable elevations rising 19.8m. 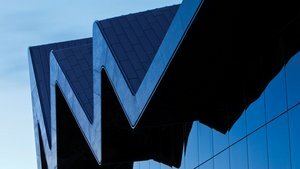 Zaha Hadid’s dynamic design for the Riverside Museum on the river Clyde presented considerable challenges for façade specialist Charles Henshaw & Sons. Not only was the specialist contractor dealing with structural glazing rising up to 19.8m to form the two gable end elevations, it also had to contend with highly irregular pane sizes and the need to maximise views down the river while minimising solar glare on the south façade. ‘The solution was to build it unitised so that each frame of glass was brought to site and then assembled in blocks,’ says Charles Henshaw pre-contract director David Cation, adding that this ensured high quality could be maintained in the factory. Charles Henshaw used a bespoke unitised system based on Schueco UCC 65 SG with the back box and brackets adapted to suit project requirements. Pane units measuring 2.2m wide and 3.4m high were then fixed to an internal steel structure designed to give large spans and views across the Clyde. The façade includes high performance solar control glass with a decorative frit finish for thermal insulation and reducing heat build-up and glare. Judges appreciated the vital role that a specialist contractor would have played in realising such a distinctive architectural vision. ‘Zaha Hadid’s building requires the glazing to be effortless when clearly in terms of uniting glazing and the huge spans it isn’t. It’s even more commendable because it’s a reasonable budget,’ says Paul Monaghan, who praised also the ‘minimal and elegant’ solution. There were some highly irregular panel sizes.